I'm a bit late writing this post, but I wanted to do the research behind it, so I kept it mentally tucked away for a few weeks. 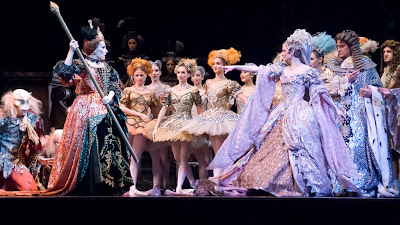 In mid-March a friend of mine was so kind as to pass along free tickets to a dress-rehearsal performance of Sleeping Beauty by the National Ballet. It was fortunate timing because a friend was coming in from out of town and had a hotel booked for that evening in the city already, so I had an instant date. Ballet can be a bit confusing if you don't know the story in advance. Certainly, appreciation of the beauty and skill is possible but with no story-line, it can be easy to get lost or confused. Sleeping Beauty was first performed in 1890, and the music is by Tchaikovsky. The waltz, included in the clip above, is probably the most recognizable tune. It is a classic good vs. evil tale with a fairy godmother and wicked witch, though I was pleased that my niece had recently gone through a Disney's Sleeping Beauty phase. It is due to her obsession with re-enacting scenes from the animated film that I could so closely follow the story. 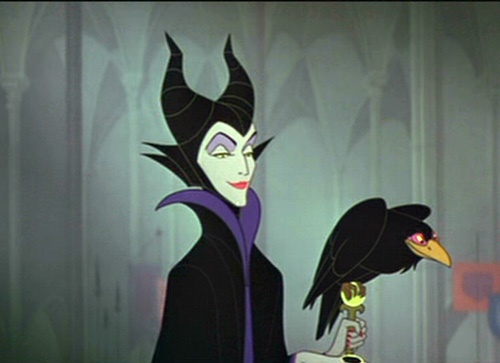 I always get to play Maleficent, pictured at left. She's the best character anyhow, in my view. In any case, Sleeping Beauty the ballet and Sleeping Beauty the Disney film are quite different. Disney is currently dealing with some controversy, as they have been trying to trademark the name Princess Aurora, which is used in both the film and the original ballet. It is likely they are doing this because they are planning to make a live action film with the story. But I digress. The ballet featured incredibly colourful costumes, wigs, and of course tutus. The sets were over the top incredible and the combination of sets and costumes alongside the moving ballet performances made for a visual feast from the first moment. My favourite character in the production was the Fairy Godmother. A little out of character for me to root for the good over evil but her costume was incredible, and made her appear to be floating across the stage. The production at the National Ballet was incredibly large, with as many as 50 people on the stage at the same time. Via the Torontoist, this is because of the use of "supers". ..."supers” (or “supernumeraries”), ... love participating in such large-scale productions. For the uninitiated, supers are volunteer extras who act to fill space on stage and increase the overall production value. They don’t dance, but they do have numerous movement cues. According to the super we spoke to, getting to dress up in such great costumes is more than enough compensation for their time. From July to September, the National Ballet is presenting The Tutu Project at the Design Exchange. In this exhibition, 60 tutus will be displayed, which is presented alongside another exhibition titled 60 Years of Designing the Ballet. It is in honour of the National Ballet's anniversary this year. Read a review of Sleeping Beauty in the Globe and Mail. See what is coming up in the schedule at The National Ballet.